← Another Snowstorm: Do You Have Bread and Milk? Today the local schools were closed so I didn’t have to get up at the crack of dawn to ride shotgun as my daughter Tory drove herself to school. I slept in . . . until 10 am! I’ve been recovering from a nasty allergic reaction to “something” and it’s taken a lot out of me, never mind that my face looked like a melted wax mask for 3 solid days. Anyway, when I finally did get up I made chocolate chip scones and watched the birds at the feeder. And started the first of seven loads of laundry. But this wasn’t the fun stuff I did today. 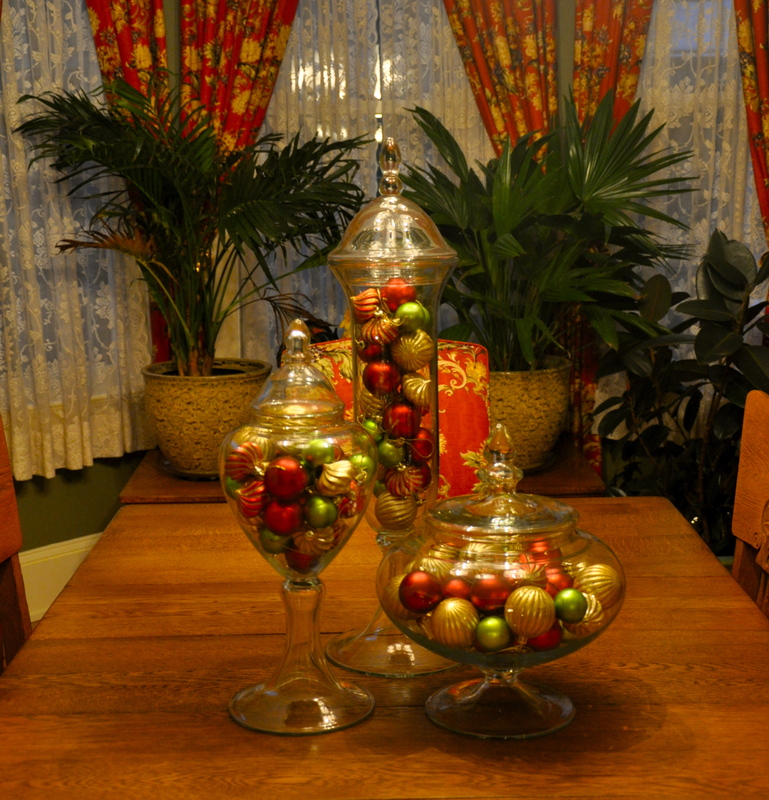 Today, I declared it a design day and created some new vignettes around my house. 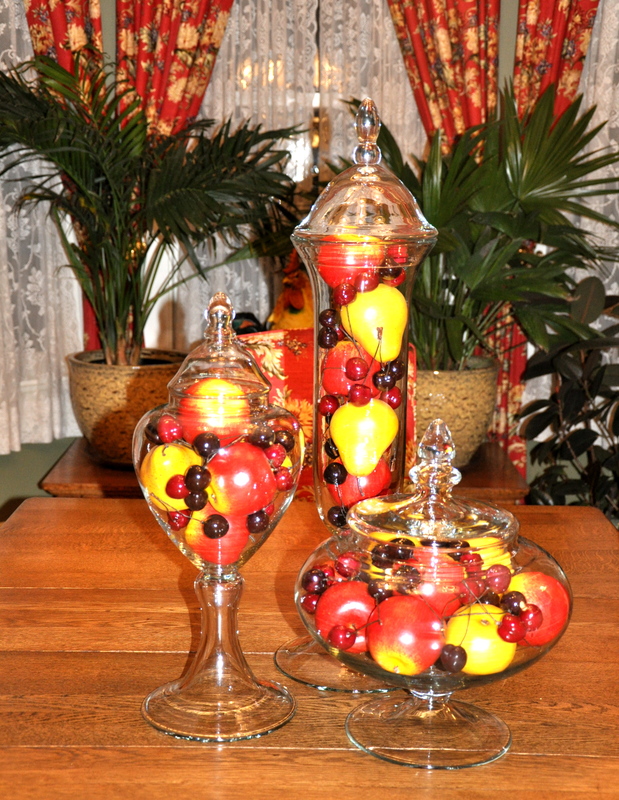 I change the contents of the jars to match the season. This is Christmas. 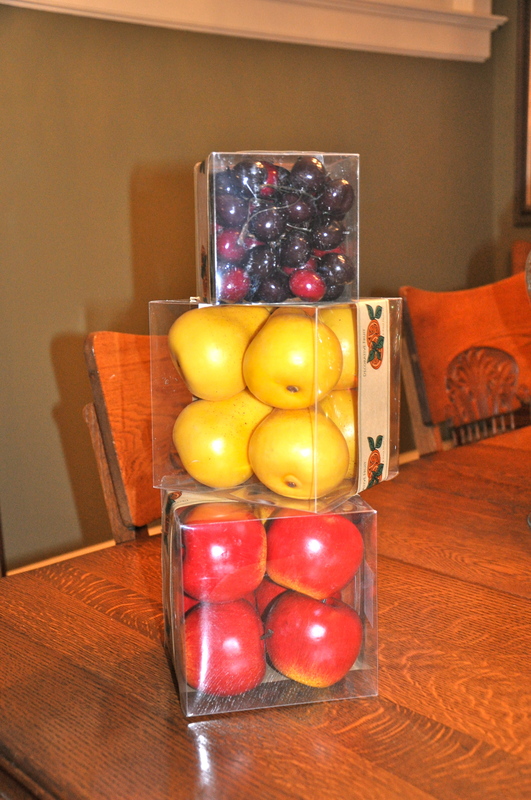 Yesterday I found some nice looking faux fruit for the jars. How do they look? Do you like them? Some are complete like this one. 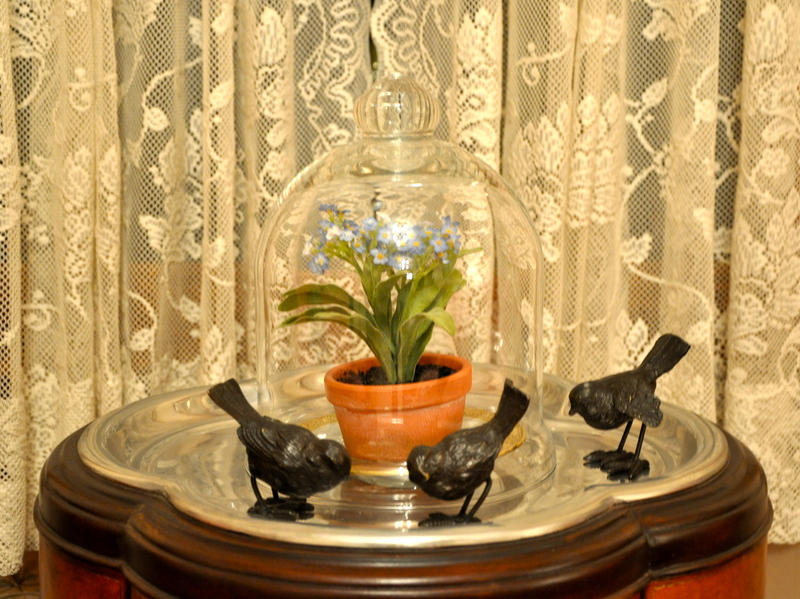 I love my little iron birds and I like how they look around the forget-me-not under the cloche. Small arrangements interspersed with my books make me smile. 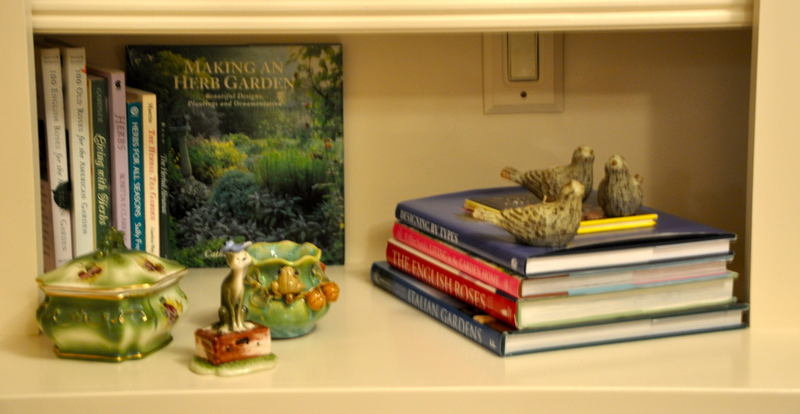 Do you make vignettes on your bookshelves? But some are works in progress. 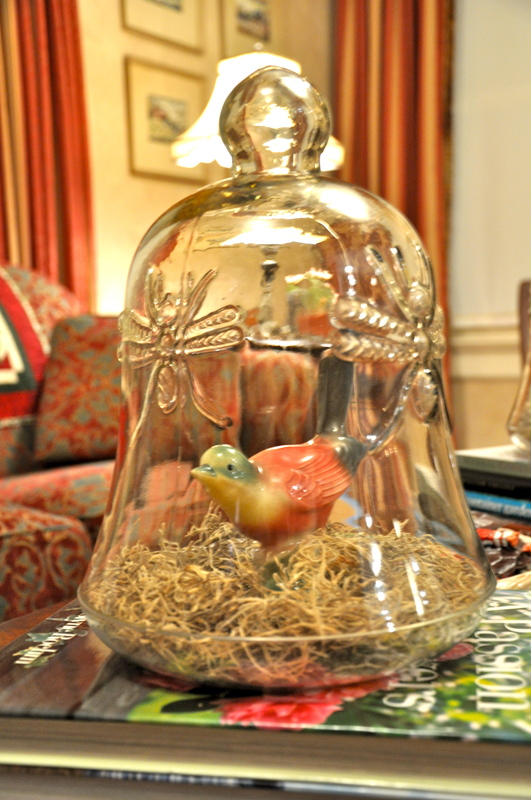 Here's another one of my garden cloches. I'll add more to this little scene. I love spending time fiddling around with my stuff when I’m “trapped” in the house. I find it relaxing and creative; the process usually keeps a smile on my face for hours. Simply put, it makes me very happy! Of course, I did go outside and shovel for an hour or so. My car and bird visitors needed swept-from-snow areas in which to hang out. And I have an almost-fetish that I have to shovel/sweep my front porch until it’s spotless. But that surely wasn’t the fun stuff I did today. How about you? Did you do something special for yourself? Great ideas! The jars look pretty cool. I have these huge ones from Italy and am always trying to decide what to do with them, how to arrange them, etc. You’ve given me some creative thoughts. Thanks.